Okay, conference call, I’ve been on some of those. Phones, right? 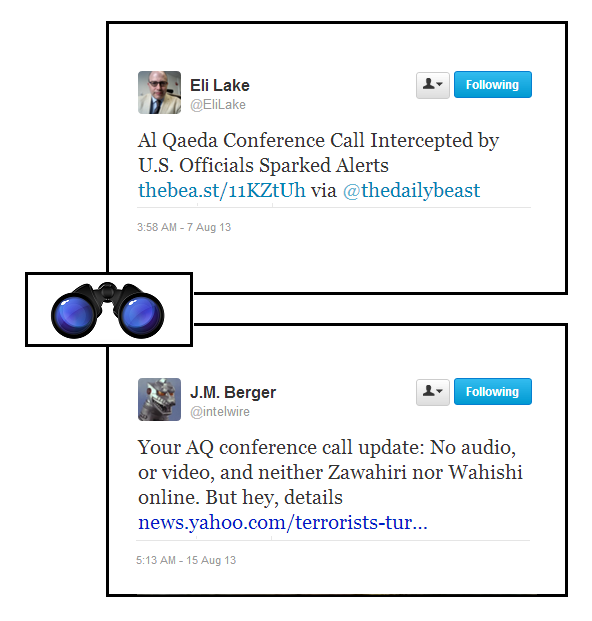 @barbarastarrcnn We used conference call because it was generic enough. But it was not a telephone based communications. Ah — Skype, maybe, or Google+? Nobody is disputing the facts of our al Qaeda story. Semantic debate over the term "conference call" totally misses the significance. Semantic? Okay… but anyway, “The crucial intercept that prompted the U.S. government to close embassies in 22 countries was a conference call between al Qaeda’s senior leaders and representatives of several of the group’s affiliates throughout the region” — right? So the jihadis have a web-forum, and messages from Zawahiri get quoted there? FYI, there’s an extended treatment of the whole affair by Ken Silverstein now up at Harper’s, Anatomy of an Al Qaeda “Conference Call” — h/t Joshua Foust. This entry was posted on Thursday, August 15th, 2013 at 10:57 pm	and is filed under #FAIL, al qaida, Charles Cameron, internet, JM Berger, media, Uncategorized. You can follow any responses to this entry through the RSS 2.0 feed. Both comments and pings are currently closed. but what i don’t get is why would anyone care? Care about what? AQ plotting a 9/11 size strike? AQ using advanced communications? Government leaks suggesting NSA-style surveillance systems succeed in breaking AQ security (at a time when NSA surveillance in general is feeling the heat of popular scrutiny)? Factually incorrect reporting of a story dealing with one or all of the above? How this poisons our understanding of any or all of the above? The generally deplorable state of journalism? The answer would be different in each case. And part of what I like about the somewhat oblique style of my posts is its ability to stir thoughts not just about one topic, but a congeries… in different minds and mind-sets. globes sticking out on your forehead or anywhere else on the face. and make you feel better about yourself.